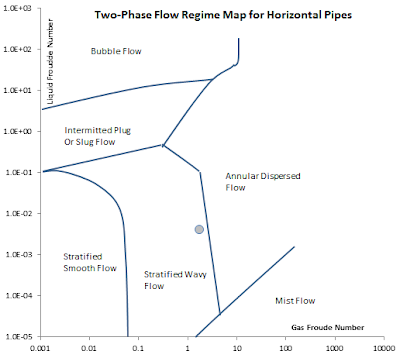 This Excel spreadsheet plots a flow regime map for the two-phase flow of liquid and gas in horizontal and vertical pipes. 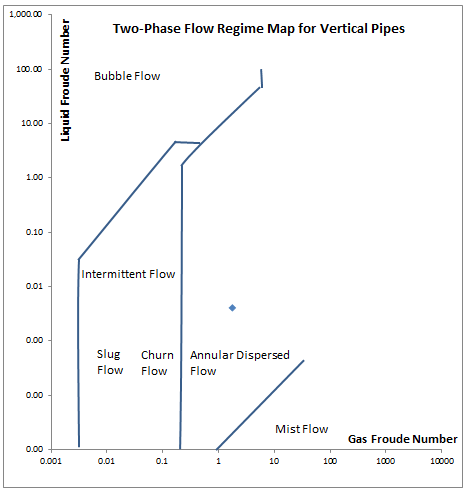 Determining flow regime is important when calculating pressure drops and pumping requirements in the oil & gas industry, and chemical production. 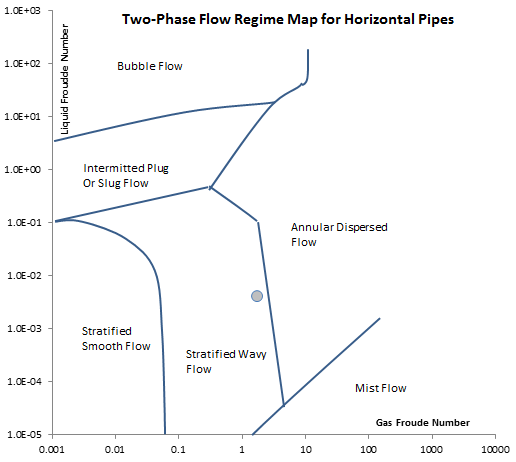 Additionally, some flow regimes are undesirable (such as slug flow, which can damage pipes through excessive vibration). Engineers will change pipe diameters and other process parameters so the flow regime is more favorable. In the spreadsheet, simply enter the liquid and gas flowrates. The spreadsheet will then plot the location of the flow on a flow regime map for horizontal and vertical pipes. The horizontal and vertical axes are the Gas Froude Number and Liquid Froude Number. There are, however, inconsistencies in the definition of flow regimes in these different maps. For example, some maps give different flow regimes at the same conditions. The horizontal and vertical maps given in Shell DEP 31.22.05.11 were developed by a single source, and have a consistent definition of flow regimes. Therefore, engineers can compare potential flow regimes in horizontal and vertical pipes.